Deck – The pool deck around an inground pool is a huge design consideration. It’s a major focal point aesthetically and it’s also a very functional part of the pool. There are two basic options when it comes to the deck around an inground swimming pool and then include a concrete deck and a paver deck. Both systems offer endless design options for color, texture, and comfort. We chose a stamped concrete that uses a stone texture in large part due to the free form shape of our pool. Using pavers would have resulted in quite a bit of wasted material. The stamped concrete deck has a base color (colored concrete) along with an accent color (applied on top of concrete), then sealed with the addition of a skid resistant material. Your pool company will have suggestions on different deck options depending on budget and the look you’re interested in. Be prepared for a hefty price tag on the deck as it can cost nearly as much as the pool itself! 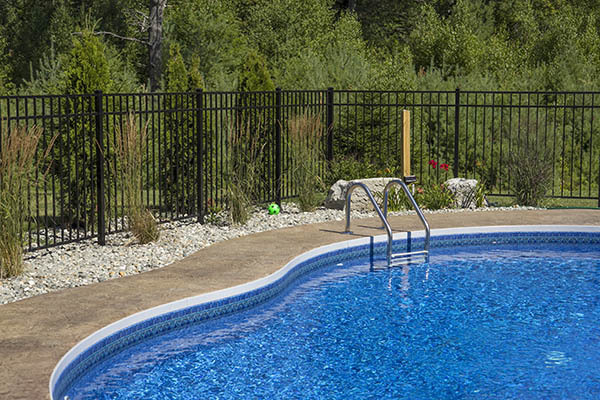 Fencing – Nearly all inground pools must be protected with a fence due to local and State laws as well as insurance requirements. Fence options are also endless but be sure to consider gates that meet special pool requirements as well as long term maintenance. We chose a powder coated aluminum fence that looks great and won’t need much maintenance. Plantings – Don’t forget to consider plantings along the pool. 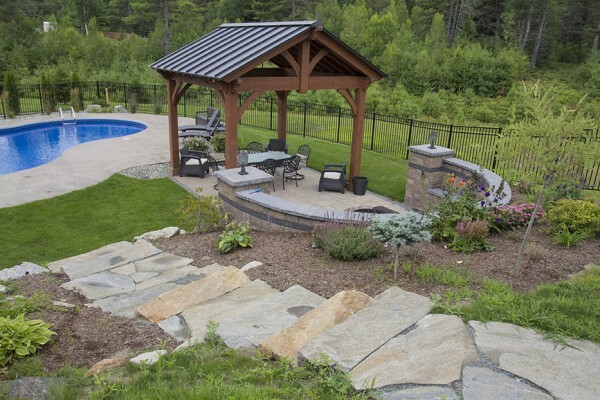 Plants, mulching materials, and features like rocks can add a dramatic affect to the finished pool and also help cut down on maintenance. We used a combination of grass, stone “mulch”, flowers, ornamental grasses, and trees to help screen our pool and create a very beautiful setting. Complimentary Structures – Another thing to consider during the planning process are other structures that might compliment the new pool. Structures that you might consider include: changing shed, equipment shed, pavilions, fire pits, and even an outdoor shower. Also don’t forget the patio furniture as it has an effect on how you lay out the deck. This is some great information, and I appreciate your point that gunite in-ground pools are the most durable. My husband and I have been wanting to get a pool put in our yard for a while, and we are finally in a financial situation that will allow us to. We’ll definitely look into getting the excavation started right away, and we’ll look into getting gunite for its durability. Thanks for the great post! This is great information, but let me just add a bit of information based on my experience. We recently retired and were looking to build a low maintenance in our new home. We chose a mid sized fiberglass pool (16 x 30) that was large enough to enjoy yet small enough for me to maintain. A heat pump was a more expensive investment than a heater, but the cost to heat from April to October in Minnesota is only a few hundred dollars (and I keep the pool at 86 in the cooler weather). An automatic pool cover greatly reduces maintenance and increases safety. Because the fiberglass pool has no true 90 degree angles, you don’t get algae blooms. Maintenance is a bi-weekly backwash, brushing down the sides of the pool a few times during the summer, throwing the robot in twice a week, and refilling the bromine tablets in the chemical feeder when needed. I check the water balance twice a week and the bromine, pH, alkalinity etc. are always spot on. If I had to do it again, without a doubt I would choose fiberglass, a heat pump and an automatic pool cover. Thanks for a great website, Todd! I’ve learned so much from your postings!